Intel has already confirmed that at this years CES the main focus will be on the release of several new chips, including those based on the new Core i3 and next-generation 32-nanometer technology platform. But just how many chips can we expect? Sources say the company has as many as 17 new chips lined up for release. The majority of the new chips will be from the company's new Core i3 and Core i5 line-up, which are already in mass production and shipping to PC makers, said Stephen Smith, director of PC client operations at Intel at a press event in San Francisco. 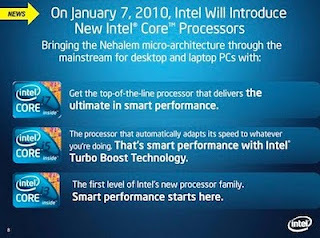 In addition to the new CPU's Intel will introduce three chipsets and various wireless components, in all 27 new products will launch at CES. Company executives did not talk about specific clock speeds or pricing information, saying those figures would be released at the Consumer Electronics Show, which will be held in Las Vegas between January 7 and 10. Intel will share CES-related news, photos and videos on the Intel Fan Page in Facebook, on Twitter and the Inside Scoop blog. A live video stream of Otellini's keynote will be on the Intel Fan Page with "Check-ins" and special badges available on Foursquare. A full media press kit is also available at www.intel.com/pressroom/ces.